In the aftermath of a colossal battle, the future of the Seven Kingdoms hangs in the balance --- beset by newly emerging threats from every direction. In the east, Daenerys Targaryen, the last scion of House Targaryen, rules with her three dragons as queen of a city built on dust and death. But Daenerys has thousands of enemies, and many have set out to find her. As they gather, one young man embarks upon his own quest for the queen, with an entirely different goal in mind. 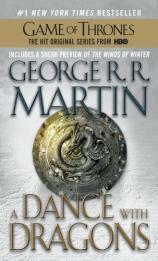 A DANCE WITH DRAGONS is the fifth installment in George R.R. 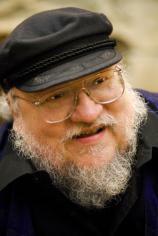 Martin's A Song of Ice and Fire series. Welcome back, Books on Screen readers! It seems things are finally starting to warm up --- if not outside, then at least on screens big and small alike. This week's top 5 on the Indie Bestseller List are State of Wonder by Ann Patchett, A Dance with Dragons by George R. R. Martin, The Paris Wife by Paula McLain, Rules of Civility by Amor Towles and The Magician King (Debut) by Lev Grossman. Published Thursday, August 18, 2011 (for the sales week ended Sunday, August 14, 2011). This week's top 5 on the Indie Bestseller List are The Night Circus by Erin Morgenstern, The Paris Wife by Paula McLain, State of Wonder by Ann Patchett, The Art of Fielding by Chad Harbach and A Dance with Dragons by George R. R. Martin. Published Thursday, September 22, 2011 (for the sales week ended Sunday, September 18, 2011).